I had been wanting to visit the Centro de Textiles in Chinchero for quite a while and finally had a day free to go on April 16. I had met Yiqian, a wonderful artist from China when I attended the natural dyeing workshop at Apulaya. 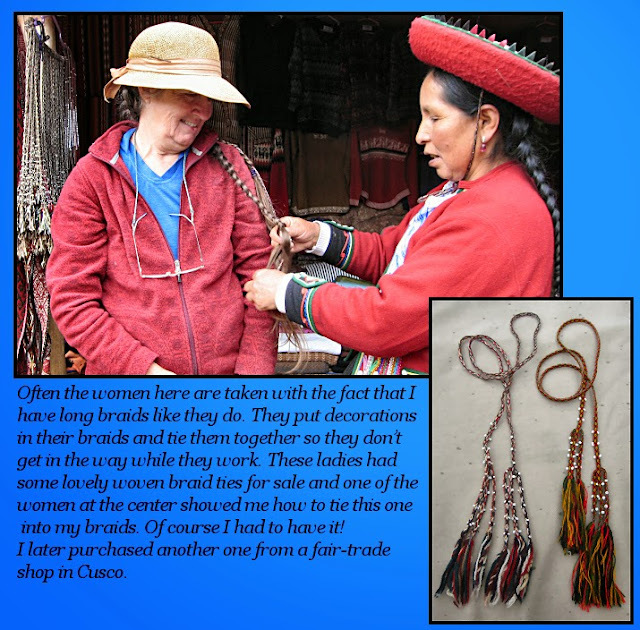 She also wanted to visit Chinchero, so on Thursday morning we set out by bus from Calca to Urubamba and then on another bus to Chinchero. Upon arriving in Chinchero, when we asked about the Centro de Textiles, we were pointed uphill toward the market site. As it turned out, we did not actually visit the well-known Textile Center that was founded by Nilda Callanaupa (which was my goal). Because we were directed uphill, we ended up visiting a couple other smaller textile centers where the women were very friendly and were also demonstrating the methods for natural dyeing, spinning, weaving, and knitting. Of the two, I enjoyed visiting Centro Textil Llank’ay the most. The women were very welcoming and since we were the only customers, we had a nice visit with them. One talented young woman was knitting a very fine chullo (hat) and manipulating three colors of yarn which she ran around the back of her neck. 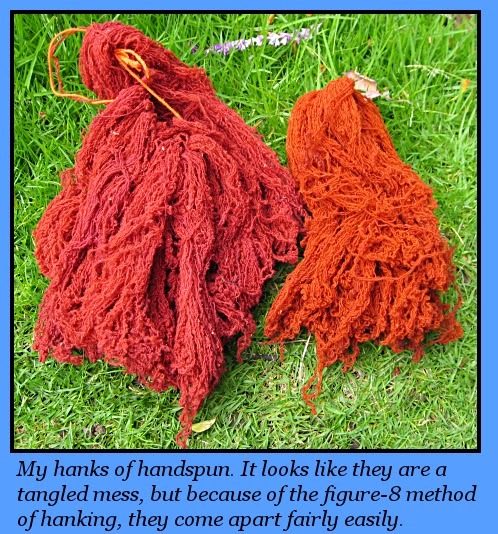 Next I was attracted by the hanks of handspun and naturally dyed yarn hanging near the dye pots. The fiber is tightly spun and is hanked, with two unplyed threads held together, in a continuous figure-8 for dyeing. Because the yarn is so tightly spun, it is dyed in “singles” (in other words, before two or more threads are plied together). This allows the dye to penetrate both threads. 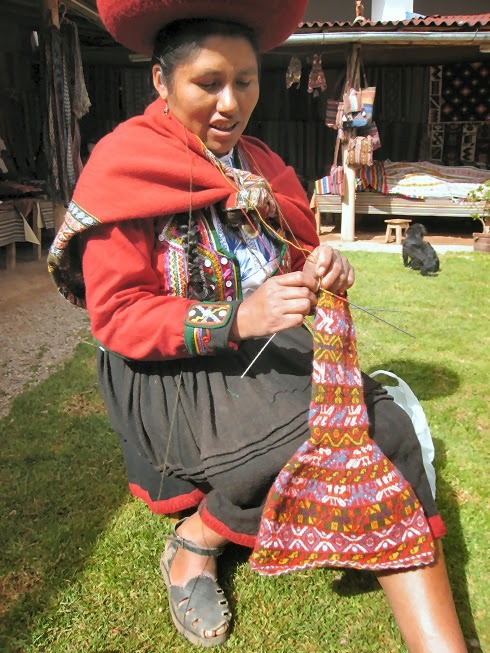 Andean women spin and ply their yarn with much more twist than we do in the US. This makes a firmer (and not so soft) yarn, but the woven fabric wears much longer than loosely spun fibers. When so much time is dedicated to creating clothing, they want it to last. After the yarn is dyed and air-dried, two threads are then plied together and it is ready for weaving or knitting. I chose a couple unplyed hanks, both dyed with cochineal, a red dye that comes from a parasitic insect of a cactus from the prickly pear family. These insects are cultivated on cactus and harvested, dried, and crushed to make a red powder. It is one of the most expensive dyes in the world. 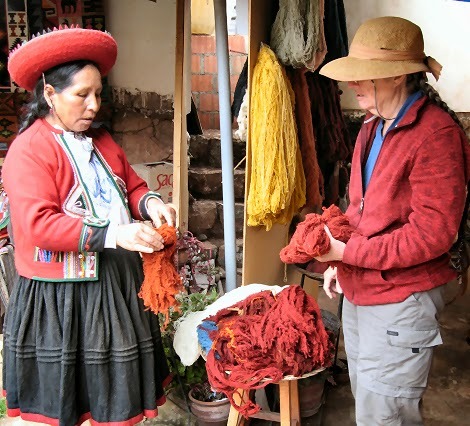 The cochineal dye yields slightly different colors depending on additives in the dye bath as well as how many times the bath has been used before discarding it. Manipulating the acidity of the bath using such things as alum and vinegar makes it possible to yield a wide range of colors from cochineal, from purple to red to orange. Then we sat down. I showed the women my little Turkish spindle, which is much smaller than their spindles. Whenever I bring it out, I get astonished faces and people eager to try it out. After we visited for a while, it was time to leave, but I brought out a collection of knitting needles that the Vashon Island knitters had donated for me to give to the women. 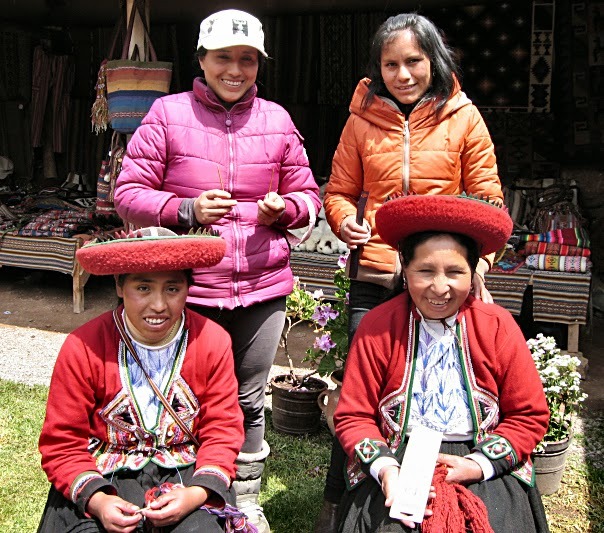 I told them, “De las tejedores de Isla de Vashon a ustedes, las tejedores de Chinchero!” (From the knitters of Vashon Island to you, the knitters of Chinchero!) They were delighted and made their choices carefully. With big smiles, they posed for a group photo. After I returned to my home the next day, I could not wait to tear into those hanks and start plying. I spent much of the day running the fiber through my fingers. The local women are able to ply directly from the figure-8 hanks, but I found it easier (and safer!) to carefully pull the threads apart and drop it into a basket. Then I made center-pull balls from the two yarns held together and plied the yarn from that ball. I later learned that this is the way that the young people prepare the hanks when they are learning to spin because they are less likely to get it so tangled. Up next! The hike from Chinchero down to the Sacred Valley…Beautiful! Many thanks to my travelling companion for the day, Yiqian, who grabbed my camera and took some photos of me!